This single unit does everything you’d want a mandoline to do—straight cuts, waffle and wavy cuts, small julienne cuts, and larger French fry cuts. In total there are 17 different thickness cuts ranging from 1mm to 9mm, in half mm increments. There is a straight blade for cutting through hard foods like carrots or potatoes, and a serrated blade that’s better for tomatoes, bell peppers, and onions. The cutting thickness is adjustable with the turn of a knob, and the julienne and French fry cutters stay covered when out of use. This model is made of angled Japanese stainless steel, so it’s built to last, and comes with a hand guard for safety and has sturdy legs to hold it at a comfortable angle while slicing. The blades are easy to remove for cleaning. Handwashing is recommended. Sometimes the best mandoline is a set rather than a single unit. 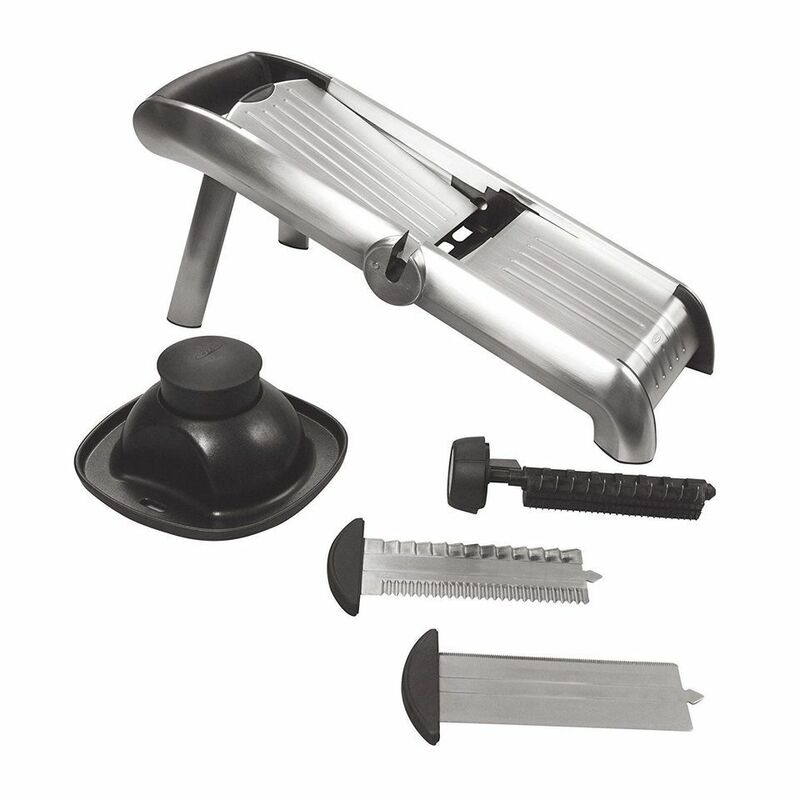 This hand-held set includes a mandoline that’s adjustable to four different thicknesses, a julienne slicer, and a coarse grater, along with a storage container that holds all of pieces. While it’s three separate cutting units, it doesn’t take a lot of storage space, or at least not more than some of the larger mandolines. If you regularly have helpers in the kitchen, this set might make sense. However, it only comes with one hand guard, so cut-resistant gloves are a good investment. These are dishwasher safe, but easy to wash by hand. If you don’t need a lot of fancy options, this inexpensive mandoline will make short work of vegetables. It adjusts to three different thicknesses, and has julienne blades that pop up for cutting zucchini, carrots, and other vegetables for salads and stir fry. This comes with a hand guard. It is dishwasher safe, but it might be easier to hand wash to clean all the nooks and crannies. If you’re looking for one tool that can slice, julienne, and do a whole lot more, this is the one you want. It’s adjustable for different thicknesses, and can make the usual straight, wavy, julienne, and French fry cuts, but it also has cutters for fine and coarse grating. A citrus juicer fits on top of the hand guard for even more versatility. This is made primarily from plastic with stainless steel blades. The legs fold for compact storage. Hand washing is recommended. If you like the idea of a mandoline for precise food slicing, but you won’t use it often enough to justify its single use, this multi-use slicer, grater, blender, and chopper might be just what you need. This comes with a bowl that the mandoline fits on top of, so food will collect in the bowl for less mess. 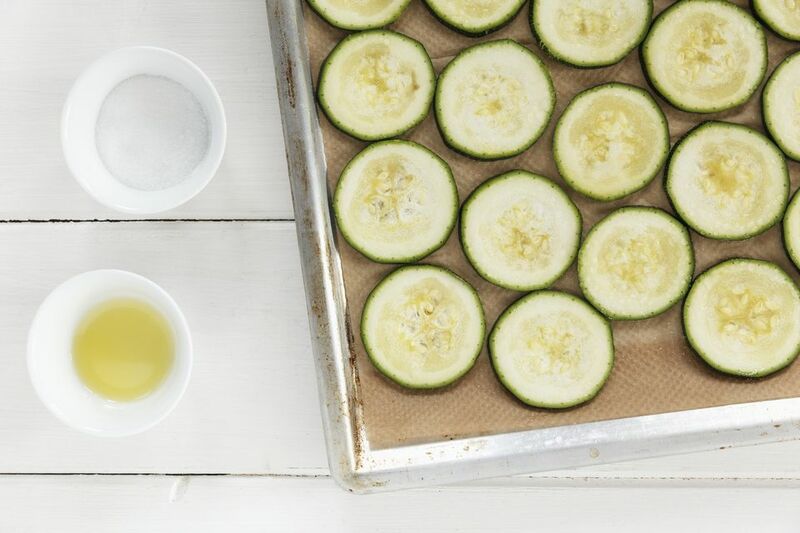 Switch the mandoline blade for a grater when you need grated cheese or vegetables. When you need chopping action use the chopping blades and just pull the handle to chop. Even better, the container is divided, so you can chop cucumbers on one side and onions on the other, keeping them separate. Remove the divider to use both blades at the same time for larger batches of food. Great for chopping nuts, fruits, or vegetables, or for making hummus, pesto, guacamole, or salsa. This includes a food holder to keep your fingers away from the mandoline or grater, two rotating blades for chopping, two mixer attachments for blending ingredients, a lid with pull-handle, a mandoline frame, and four inserts (slicing, shredding, grating, and julienning). All parts are top-rack dishwasher safe for easy cleaning. This hand-held mandoline adjusts to three different thicknesses for slicing fruits and vegetables. It has a non-slip handle and the non-slip “foot” on the end keeps it from slipping around on the work surface. Since part of the mandoline is clear, you can see slices below so you know how much you’ve cut. It is dishwasher safe and comes with a hand guard. Unlike other models, this one does not make julienne, wavy, or French fry cuts. Produced by the company that created the original mandoline, this can make straight, wavy, and julienne cuts from paper thin to 1/2-inch thick. There are additional blades available separately for making julienne cuts of different sizes. This is a large, sturdy unit that weighs five pounds, so it might be a little bit too large for some folks who want a more compact unit. The sturdy legs fold flat for more compact storage. The included hand guard is made from stainless steel and rides on rails on the mandoline, so it’s very safe. However, if you want to make waffle cuts, you can’t use the guard since you can’t turn the vegetable to make the second cut, so extreme care should be taken or cut-resistant gloves should be used. Since this is stainless steel, it should be dishwasher safe, but hand washing is likely to be easier. This has a straight blade for hard foods like carrots as well as a serrated blade that is better for tomatoes, bell peppers, and onions. It can also make julienne and wavy cuts. The blades are integrated into the machine and the blade selection and the thickness are adjusted with the turn of a dial on the side of the mandoline. The legs fold up for storage, and a hand guard is included. This is dishwasher safe, but hand washing might be easier, to get into all of the nooks. If you’re more likely to cut large potatoes, melons, eggplants, or even small cabbages, this wide-bodied mandoline will be able to handle those large vegetables with ease on its 6 ½-inch wide cutting surface. It is made from plastic with a stainless steel blade and includes a hand guard. It has a fixed straight blade that makes thick slices. If you need more versatility, Benriner also makes similar mandolines with multiple blades and adjustable cutting thicknesses, but they aren’t this wide. This is top-rack dishwasher-safe. This V-slice mandoline has reversible blades for two different slicing thicknesses as well as different blades for julienne and French fry cuts. V-slicers tend to be better at cutting softer foods, like tomatoes, than mandolines with straight blades, but they work well for other types of food as well. This mandoline is made primarily from plastic with stainless steel blades. It includes a hand guard, but does not have legs. All four of the pieces fit together in a compact holder for easy storage. It should be washed by hand.